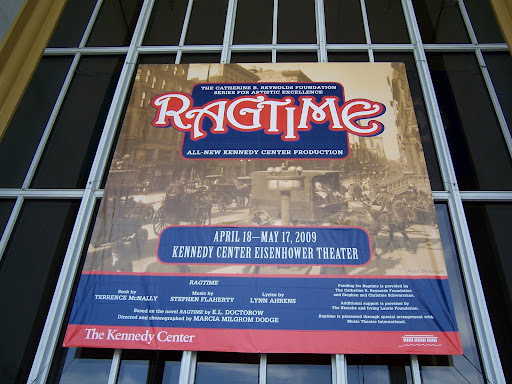 Ragtime has been extended an additional week at the John F. Kennedy Center for the Performing Arts! Our first performance is April 18th and we are now running through May 17th. If you haven’t gotten your tickets, hurry – the show is selling like hotcakes! I have my ticket for the 14th! I am also dragging Anita O’Leary along with me. She needs to get out more. From the Metro Weekly Review:”And mention must be made of the perfect casting of Migliaccio as Emma Goldman. ”The Night Emma Goldman Spoke At Union Square” is one of this show’s most arresting visual moments.”I’m seeing you tonight…absolutely excited! Saw the show tonight and we were greatly moved by it. Except for climbing all those stairs it looks like a blast to be a part of. Saw pre or post B’way version here in ’98 at the National and don’t remember being nearly as impressed. With all the shows that are produced here that have “broadway bound” rumors and/or aspirations this is by far the most deserving and timely we have seen in 10 years. Any hopes in that regard?